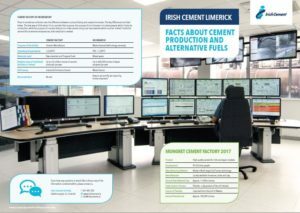 Irish Cement have published a factsheet on the use of Alternative Fuels in the production of cement at the Mungret factory. The document includes frequently asked questions and details the plans for transitioning to the use of alternative fuels over the coming years. The factsheet is available for download in pdf format [2.2 Mb].